The mobility of people and freight is fundamental to economic and social activities such as commuting, manufacturing, distributing goods, or supplying energy. Each movement has a purpose, an origin, a potential set of intermediate locations, and a destination. Mobility is supported and driven by transport systems which are composed of infrastructures, modes and terminals. They enable individuals, institutions, corporations, regions and nations to interact and assume economic, social, cultural or political activities. Understanding how mobility is linked with the geography of transportation is main the purpose of this textbook. 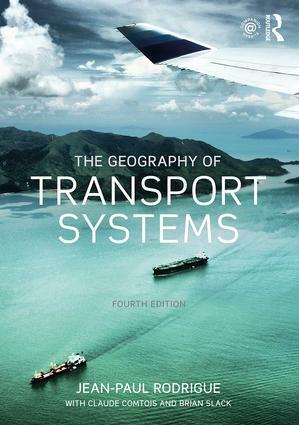 Mainly aimed at an undergraduate audience, the Geography of Transport Systems offers a comprehensive and accessible introduction to the field with a broad overview of its concepts, methods and areas of application. This material is provided to practitioners, policymakers, educators, researchers, students, and individual learners and includes a wide variety of media elements such as maps, figures and PowerPoint presentations. The textbook is divided in twelve chapters. The first nine chapters cover a specific conceptual dimension of transport geography, such networks, modes, terminals and urban transportation. In addition to these conventional topics, emerging issues such as globalization, supply chain management, information technologies, energy and the environment are also thoroughly discussed. Since transport is a field of application, the use of methodologies is particularly relevant to assist transport operators allocate their resources (investments, infrastructure, vehicles) or to influence public policy. The tenth chapter focuses on qualitative and quantitative methodologies linked with transport geography such as accessibility, spatial interactions and graph theory. The convergence between methodologies and information technologies has led to many new analytical opportunities, notably with geographic information systems for transportation (GIS-T). Transportation is a very active field of investigation and application to real world issues, which are covered in the eleventh chapter. These include, among others, city logistics, cruise shipping, high speed rail, or the financing of transport infrastructure. DO NOT COPY, REDISTRIBUTE OR TRANSLATE THE CONTENTS OF THIS WEB SITE. The content of this site can be freely used for personal or classroom use ONLY. Although the material contained in this web site is freely available, it is not public domain. Its contents, in whole or in part (including graphics and datasets), cannot be copied and published in ANY form (printed or electronic) without consent. The material, such as maps and figures, can be freely used for educational purposes such as for classroom presentations as long as it is not redistributed to the public. This excludes any other form of communication such as conference presentations, business presentations, published reports and papers. PUBLISHERS: Permission requests to reproduce published materials have become abusive as publishers often ask for material (e.g. figures, maps, charts) to be granted unlimited use, in any language, on any media, for an unlimited amount of time and to have to right to grant third parties (anyone) to use the material. This means that such permissions ask the author to give his work away to the publisher to do as it pleases. Therefore, I rarely grant permission to reproduce my material. If I do, it is for a single use and without the right for third party use. Permission to use any graphic material herein in any form of publication, such as an article, a book or a conference presentation, on any media must be requested prior to use. Information cited from this web site should be referred as: Rodrigue, J-P et al. (2017) The Geography of Transport Systems, Hofstra University, Department of Global Studies & Geography, https://transportgeography.org. Alternatively, the book can also be cited: Rodrigue, J-P (2017), The Geography of Transport Systems, Fourth Edition, New York: Routledge. I usually do not provide interviews and advice unless compensated. The only exception is for the press. By default, NONE of the graphic material in this web site can be used for commercial purposes without my consent. Instances of plagiarism will be reported to clients and supervisors. Even if plagiarism is done for internal or confidential reports, this does not remove the risk of detection. I am often asked to act as a third party reviewer for consulting reports through non disclosure agreements. Also, on some occasion, clients will release elements of these reports to the public thinking that they are original work. Consultants wishing to use some graphic elements contained in this web site, please contact me. For a reasonable fee, I can provide customized maps and graphics for unlimited use (I am also a consultant). On some occasions (e.g. humanitarian work, NGOs, charitable organizations), the use of some graphic elements can be authorized at no charge. This material (including graphics) can freely be used for educational purposes such as classroom presentations. Any other uses, such as conference presentations, posting on web sites or consulting reports, are FORBIDDEN. The material cannot be copied or redistributed in ANY FORM and on ANY MEDIA. For specific uses permission MUST be requested. Dr. Jean-Paul Rodrigue, Professor of Geography at Hofstra University. His research interests cover transportation and economics as they relate to logistics and global freight distribution. Specific topics include maritime transport systems, global supply chains, gateways and transport corridors. Copyright © 1998-2019, Dr. Jean-Paul Rodrigue, Dept. of Global Studies & Geography, Hofstra University, New York, USA.